Born in Bridgeport, Dorsetshire, England. Studied painting at the Royal Academy in London and in Paris. Known in Europe for oils, watercolors, and etchings of scenes in Brittany and Holland. From December 1913 he traveled and painted in India and China before arriving in Japan in 1915. 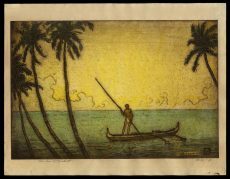 In 1916 Watanabe Shozaburo produced 21 prints from his travel paintings. Bartlett left Japan in 1917 intending to return to England via Hawaii and the U.S., but remained in Hawaii for the rest of his life. According to Watanabe’s records he published a total of 38 Bartlett prints, with the latest, Hour of Prayer, India, dated 1925. Some are undated and some are of Hawaiian subjects. Blocks at Watanabe’s shop were destroyed during the fire following the 1923 earthquake; other blocks were scored after Bartlett’s death so that no further prints could be made. ** Taken in whole, or in part, with permission from: Merritt, Helen and Nanako Yamada. Guide to Modern Japanese Woodblock Prints: 1900-1975. University of Hawaii Press: Honolulu. 1992.